September is almost over which means HOCKEY HOCKEY HOCKEY!!! In preparation for the new season the Stars Asylum is offering a few new shirts – something to prepare you for the new season! Drafted 10th overall this past summer, Valeri Nichushkin is quickly becoming a fan favorite. He shows the love for the game the Russians are known for and the fans appreciate it! 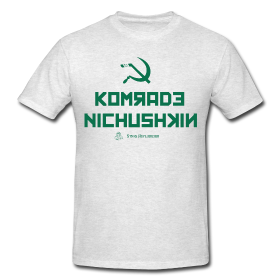 So if someone asks if Nichushkin is your Komrade you reply with a hearty “DA”! Michael Gruber is the Dallas Stars new in-game music man, following in the footsteps of a long tradition of great DJs. 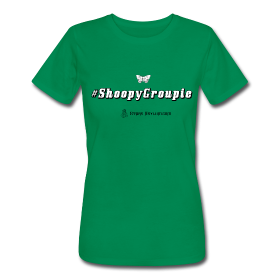 “Shoopy”, as he’s known when spinning the digital turntables (that is what you younglings say these days, right?) 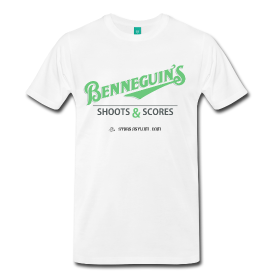 has tons of fans and they’ve made this our most requested shirt. Welcome to the Stars team, Shoopy! Warden Andy and Warden Jay are STUPID excited to mark you as their property, so get on it, inmate! Show your Asylum pride with our first shirt with our logo on it!! The Property Of shirt has the Stars Asylum logo, front and center. 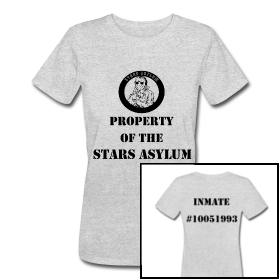 Additionally, if you want to spend a few more bucks purchase the Property Of shirt with an inmate number stamped on the back – the best inmate number of all: #10051993! Get it? October 5th? 1993? Get it? SHUT UP AND TAKE MY MONEY ALREADY!! Every single one of our shirts are available in TONS OF COLORS, including white, gray, orange, red, yellow, shades of blue, shades of green, pink … you get the point.We can also produce shirts in different styles (long sleeve? female cut? baby onsies? coffee mugs? No, seriously, coffee mugs! iPHONE CASES!!!! Seriously, check out the store product options and if you want a specific style email sales@starsasylum.com and let us know what you’re interested in! Tell your friends – BUY A SHIRT! New Shirt! King Loui and the Game of Chairs made of Hockey Sticks! Look out NHL, Loui is Coming! For years the fans in Dallas have watched Loui Eriksson rise to stardom: two years called one of the league’s most underrated players; 2011 All Star; Rookie of the Year in Sweden; Rookie of the Year in the AHL; and one of the top leaders in both the locker room and on the ice. And now IIHF Gold Medalist with an entire country thanking him for getting their team to that big game. We know him as King Loui. If we had a throne I’m pretty sure this is what it would look like: hockey sticks, fused with the blood of so-many-fights, topped with the triple crown of Sweden. No other could sit in it – no other would try. 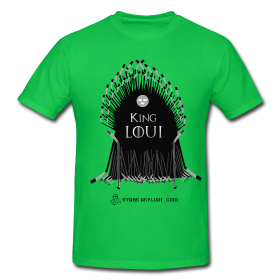 King Loui is our man. He’s no longer “underrated” or “unknown”. He’s passing, he’s scoring, he’s leading our Stars. Watch out NHL because Loui is Coming. To get the shirt, visit our store! As with all of our shirts, these are available in many colors including black (why? but the design is…but), white, orange, brown, and yellow (doesn’t that just seem gratuitous?). Special thanks to former DFW resident KPO_Tweets for the AWESOME design! New Shirt! May the Fourth be with you – and Jedi Jamie! Jedi Jamie – This is the center you’re looking for! May the Force be with you. That’s where today’s “holiday” comes from – fans of a make-believe world where a boy falls in love with his sister while learning that his father just cut his hand off. What a world … it’s also a world where a higher power guides us and gives the Jedi his powers. Jamie Benn has some of the sweetest hands in the NHL. With a wave of his hand he makes defensemen across the league forget what they’re doing with a little “this is not the puck you’re looking for”. The future of our Dallas Stars, Jamie has the heart and drive to be a super star in this league and we’re just here to ride the train. Using lightsaber sticks and mediclorians Jamie is leading the way for the future of this franchise. He has great things ahead of him. 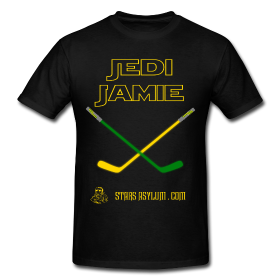 So today we say “May the Fourth be with you” – today, celebrate your geek-hood, your green blood, and your love for Jamie Benn by purchasing this shirt and showing your true colors. To get the shirt, visit our store! As with all of our shirts, these are available in many colors including black, white, orange, brown, and yellow (doesn’t that just seem gratuitous? ).